Surfing is the art of riding the face of a wave with direction and control. More skilled surfers can use more parts of the wave face to generate speed for bigger / more extreme manoeuvres. Pocket – the most critical part of the wave. The pocket is the steepest, fastest bit of wave face which is still green but is about to “break” into white water. Foam – what is left after the wave breaks. White stuff. Paddle out – if we are surfing from land, then we are going to have to paddle out far enough to catch a wave. Start small. Learn to control your direction and speed in the foam before trying for green waves. Don’t get in other peoples way when paddling out. Bottom turn – the fundamental move of surfing. As you scream down the face, you need to turn left or right (depending on the wave). All waves are lefthanders or righthanders. There is no such thing as a straighthander. If you don’t bottom turn you will run out in front of the wave and lose all the speed you generated, ending your ride in the foam. By bottom turning we can continue our high speed ride across the wave face and…. The Run – as you scream out of the bottom turn you can look ahead at the walling wave face. Aim the nose back up the face, engage your rails and use your speed to climb back up. At the top, you can top-turn back down the face, using gravity to build more speed. By linking top and bottom turns to generate speed you can ride the full length of the wave. Remember the fastest part of the wave is the pocket, so try not to outrun it. Tricks – Tricks can be done anywhere on the wave face. Aerial moves are based on late top-turns, spins and cutbacks can be used to stall or slow you down on the face, enders and pirouettes can end our ride with style at the bottom. Or you can just enjoy charging down the line. Speed – surfing is all about speed. Which because of physics means waterline length. Short boats are slower than long boats. Rocker also slows surf craft down. The flatter the hull, the faster it will plane. 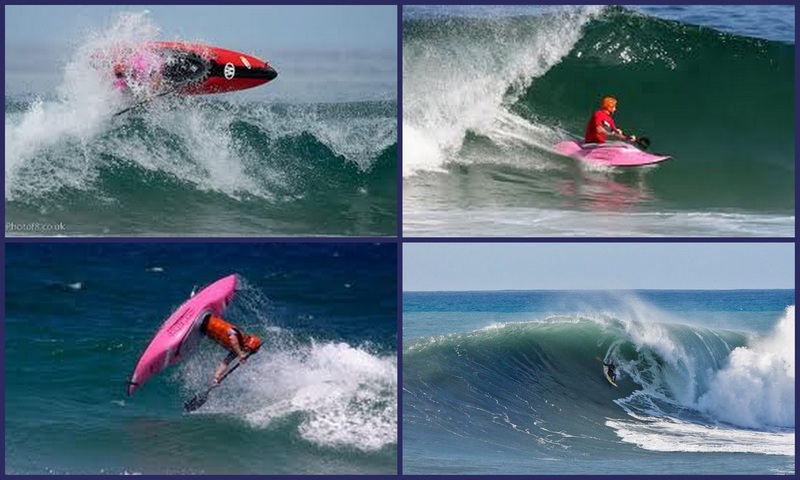 Ultrashort playboats with lots of rocker make it harder to catch waves. Grip – more grip means you can ride more critical (ie steeper) sections of the wave, and can climb back up the face more easily. Surfboards, SUPs, waveskis, surf kayaks, all have very sharp rails which act like a keel in the wave face enabling them to generate speed and height. They also all have fins which act in a similar way. Rounded kayak hulls cannot grip the wave face in the same way so tend to slide sideways down the face. Kayaks with long slicey back ends like 90s playboats surf OK, together with a beachward stern rudder to keep the rails in the wave face. Right of way. Person nearest the peak has right of way, OR person who was riding first. If you are still using your paddle, you are not riding! Don’t drop in – if someone else is on the wave, you cannot paddle for it. Don’t paddle out through the break – don’t get in the way of riders coming in, paddle out somewhere else or get run over! Paddle through the whitewater BEHIND oncoming riders, not in front of them. Don’t ditch your gear – it could hit someone. If you cannot exit your boat without letting go of it you aren’t ready for whitewater or surf yet. Say sorry if you get it wrong!